This neat little gadget is from stylus specialist Adonit, which is looking to broaden its product range and appeal with the PhotoGrip, now available in the UK for £44.99 (it’s $39.99 in the US). It will be available via Amazon and the Adonit website. We’ve seen smartphone clamps before but this one seems particularly neat. It attaches in the usual fashion, via an adjustable clamp which fixes across the width of your phone. It can accommodate both naked phones and phones in cases, as long as they are in the width range 62.5-85mm and have a body thickness no more than 10mm. The latest cameraphones are better than many photographers give them credit for, but they’re slippery little devils which are awkward to hold and shoot with, and a detachable grip makes them much nicer and secure to use – and as Adonit points out, it makes one-handed selfies less likely to result in a dropped camera. But you don’t have to hold your smartphone at arm’s length to get in the shot, because the PhotoGrip comes with a detachable Bluetooth remote with a range of up to 10m. For any kind of remote photography you’re going to need a way to stand your camera up, and the PhotoGrip has that covered too. It has a tripod thread in the base for attaching an included mini-tripod (or your own tripod, if you’ve got one with you). Alternatively, the grip is designed to be free-standing, holding your smartphone in vertical orientation on any flat surface for FaceTime, live streaming on Instagram and any other social sharing needs. There’s even a little editing stylus stored in the side of the grip. 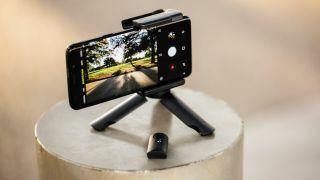 The PhotoGrip has a rechargeable internal battery that’s good for around 20 hours of continuous use (or up to 72,000 photos, we’re told), and is compatible with iOS 5.0 and Android v4.3 and above. As if all the other goodies weren’t enough, it also comes with a carry pouch and neck strap.